Akron, Ohio (September 10, 2018) – PowerNation TV’s Engine Power is finishing up the UMP DIRTcar Modified race car in honor of Summit Racing Equipment’s 50th anniversary. The car will be auctioned off during the Summit Racing Modified Mania, September 27-29 at Tri-City Speedway in Granite City, IL. The auction will be held Saturday, September 29, with proceeds to benefit Shriners Children’s Hospital. 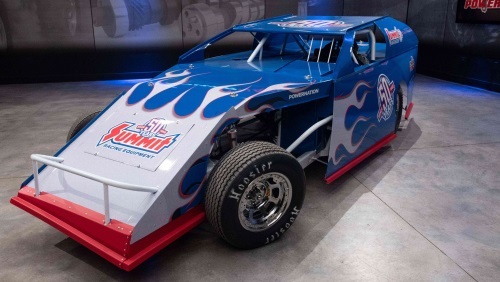 The Summit Racing DIRTcar Modified build covers three episodes of Engine Power during the PowerNation TV Powerblock on the Paramount Network. In Episode One, you’ll see some of the engineering that goes into a UMP Modified as Impressive Race Cars’ Don Jumper helps Pat Topolinski and Mike Galley assemble the car from the chassis up, including suspension, brakes, rear axle, and wiring. In Episode Two, Mike and Pat build and dyno-test a killer 410 cubic inch small block Chevy for the car. It will have good stuff like a Dart SHP Pro block, Brodix top end kit, Quick Fuel Q-Series carburetor, and Schoenfeld headers. This episode is scheduled to air October 14. And in Episode Three, Pat and Mike wrap up the project with final assembly and track testing. This episode is scheduled to air October 21 on the Paramount Network. Check your local listings for exact episode air times. General admission for the Summit Racing Modified Mania is $20 Thursday and $25 Friday and Saturday. Children 12 and under are free. General admission gates open at 5:30 pm. Pit passes are also available. Summit Racing Equipment has been the World’s Speed Shop® for over 50 years! Summit Racing is the world’s largest e-commerce, mail order, and retailer of performance automotive parts and accessories. Summit Racing offers a huge selection of parts in stock from over 1,500 manufacturers for all forms of racing, street performance, off-roading, restoration, tools, and diesel. It also offers no-hassle special ordering, fast ground service shipping to most areas of the country, and same-day shipping on in-stock items. Summit Racing has the industry’s top-rated customer service and a full-time technical department to answer your questions. With headquarters in Tallmadge, Ohio, Summit operates distribution and retail stores in Tallmadge; Sparks, NV; McDonough, GA; and Arlington, TX.